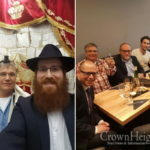 Rep. Brad Sherman (D-Sherman Oaks) patiently waits at the Chabad of the Valley Booth at Last Sunday’s Israel Independence Day Festival at Woodley Park, while “Rabbi Mordy” fumbles around a pile of tefillin trying to find a special set of phylacteries for the congressman — who is a lefty. The rabbi finally finds the right set, pulls up Sherman’s sleeve and wraps the black leather strap around his arm. This is for the heart, the mind and the soul,” he explains, and then recites the blessing slowly, waiting for Sherman to repeat after him. After the ritual is done and the congressman rolls down his sleeve, the rabbi turns constituent. “How’s it going in Washington?” he asks. “We’re doing what we should have done in 1997,” Sherman replies and hands him one of his famous campaign combs, a joke playing off Sherman’s diminished hairline — which is not currently visible beneath the gray felt yarmulka perched atop of his head for the tefillin ritual. Maybe Sherman should wear the kippah all the time. 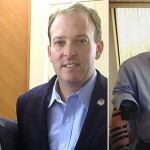 If the congressman is a lefty, how come the picture shows him with the tefillin on his left arm? 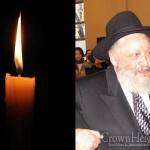 u go rabbi mordy.. chabad of the valley rocks!!!!!!! Tefillin is put on the left hand regardless of whether you are right-handed or left-handed. The arm-tefillin is laid on the inner side of the bare left arm, two finger breadths above the elbow, so that when the arm is bent the tefillin faces towards the heart.